Over the last few years, the homebrew arcade market has spawned a number of businesses specializing in prefab cabinets-- think IKEA meets MAME. They ship you the cabinet in a large box, and you assemble it with a screwdriver and install standard PC monitors and components inside. Cocktail cabinets are more space effective, but have some peculiarities. The classic cabinet is head-to-head, so it can only play games in vertical orientation. The screen "flips" for each player's turn. That's a serious limitation, since many arcade games are designed to be played horizontally. The kit I ordered is the best of both worlds, with controls for both vertical (head to head) and horizontal games (side by side). 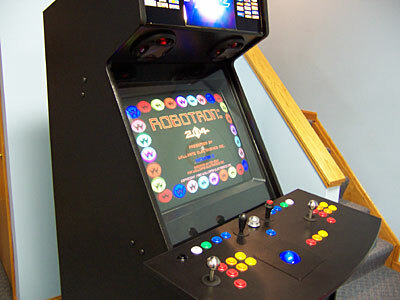 There are comprehensive reviews of the side-by-side cabinet and the head-to-head cabinet at RetroBlast. If I had the space, I'd choose a traditional upright arcade cabinet. In the meantime, the cocktail is a better choice for me; it takes up less space, can roll on casters, and, if necessary, can be covered with a tablecloth. I'm looking forward to the kit arriving. I do have a few minor modifications planned, such as mounting speakers on the outside of the cabinet, installing a real arcade coin door on the side, and some LED lighting. You're never too old to finally realize that childhood dream: to be the kid who owns his own arcade game! * Hmm, how about a MAME coffee table project?